The latest leak of data about international tax offenders, ‘Paradise Papers’, has prompted former UK prime minister Gordon Brown to launch an online petition to the Group of 20, seeking an end to all tax havens. “It’s one of today’s greatest injustices, allowing the richest to stand aside while the rest of us pay for health, education, and protecting the most vulnerable. “But now we have a chance to stop it – through an international agreement that outlaws tax havens and imposes penalties and prison sentences on tax evaders. And the G20, the leaders of the world's biggest economies, can make it happen. “Please join me in signing this open letter to Argentine President Mauricio Macri, chair of the G20 – if a million of us sign, I will personally deliver it to him, asking him and other G20 leaders to take urgent action to finish the job we began in 2009. “The G20 is the right home for this issue – and has already made real progress in forcing tax havens to clean up their act. So there’s already momentum, and now the Paradise Papers give us the chance we’ve been waiting for to finish the job. “The level of global inequality is appalling – 8 people own as much wealth as half the planet. “And the gap is growing, thanks in part to the shadowy world of tax havens which lets trillions be siphoned offshore from our economies. Right now, the rich get richer, and the rest of us pay. “Eight years ago the G20 agreed it would shut down these practices. It's time to deliver. 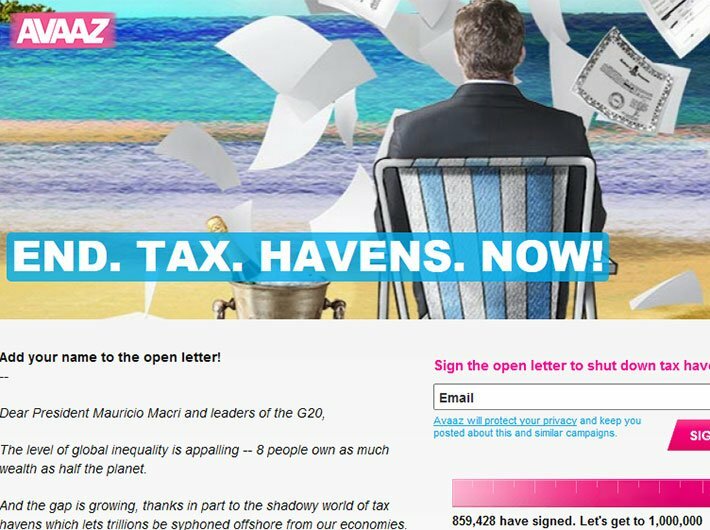 We call on you to act immediately to end tax havens and ensure that those that run and exploit them are held to account.